(Phys.org) —Researchers from Intel, the University of Massachusetts and the University of Washington have teamed up to build an e-paper display that can be powered by the Near Field Communication (NFC) signal from a smartphone. Called a wirelessly bistable display tag, the device works by harvesting more energy from the NFC transaction than it consumes in converting the data it receives into an image on the display. The resulting device has been dubbed the NFC-WISP E-Ink Display Tag. The whole point of the new device is to address the continuing problem of limited battery life offered by smatphones. Instead of improving the battery in the phone or reducing its power consumption, the team on this new effort sought to maximize the power that is used. The result is an e-paper device that only needs power when updating its image, i.e. it's a zero static power device—images that are normally displayed on a phone, such as a map, or contact information can be sent to the WISP device for viewing while the phone is switched off, prolonging its battery life. The WISP device measures 2.7 inches and has 0.5MB of embedded FRAM to hold the screen data it needs to display, and the researchers say, it can be scaled to accommodate larger screens if desired. To use the device, the smartphone software is initiated and it and the WISP device are placed together for a moment, just as with other NFC transfers. Soon, the image from the phone is displayed on the WISP Display Tag. At that point, the phone can be turned off—the image on the WISP can be displayed indefinitely without any additional power. This project is a collaboration between labs at the University of Massachusetts Amherst, University of Washington, and Intel Labs. See our publication in ACM Ubicomp 2013, titled "Wirelessly Powered Bistable Display Tags." 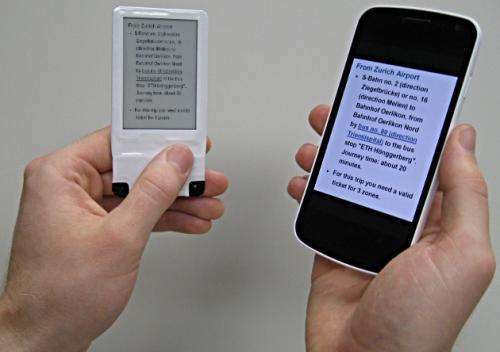 The quality of an e-ink display isn't up to that of smartphones of course, and the demo model of the WISP device only displays black and white, but that isn't the point of the device after all. Its sole purpose is to provide a means for displaying smartphone data while the phone is turned off. What's most important about the WISP device though might be what it portends—new phones with an e-paper screen built in, perhaps, or watches that can be updated simply by bumping them with a smartphone. The research team will be presenting their device at next month's Conference on Pervasive and Ubiquitous Computing.